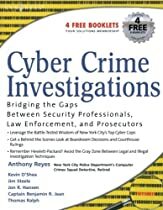 Written by a former NYPD cyber cop, this is the only book available that discusses the hard questions cyber crime investigators are asking. The book begins with the chapter “What is Cyber Crime?ย” This introductory chapter describes the most common challenges faced by cyber investigators today. The following chapters discuss the methodologies behind cyber investigations; and frequently encountered pitfalls. Issues relating to cyber crime definitions, the electronic crime scene, computer forensics, and preparing and presenting a cyber crime investigation in court will be examined. Not only will these topics be generally be discussed and explained for the novice, but the hard questions โ€•the questions that have the power to divide this communityโ€• will also be examined in a comprehensive and thoughtful manner. This book will serve as a foundational text for the cyber crime community to begin to move past current difficulties into its next evolution.